What is the average price for Used Mercedes-Benz Metris? How many are for sale and priced below market? What Mercedes-Benz Metris model year and mileage can you get for your budget? Where does used Mercedes-Benz Metris rank in comparison to competitor vehicles? What Is The Average Price Of A Used Mercedes-benz Metris By Model Year? What Is The Average Price Of Used Mercedes-benz Metris In The Top 10 Cities? Introduced three years ago to replace the Sprinter van formerly sold in conjunction with Fiat-Chrysler, the 2018 Mercedes-Benz Metris carries forward with the design that makes it unique in the segment. As commercial vans go, the Metris is a good value given its midsize design, fitting somewhere in between the smaller city vans and much larger cargo vans now commonly seen. The Mercedes-Benz Metris is often a bit more expensive than rivals. But because of its unique size and its better options packages and (often) resale value, the Metris remains a good choice in the commercial market. The Metris comes in a variety of upfitter packages for cargo and work duties, as well as a Passenger model that offers better interior refinement and lots of seating. For 2018 the Metris continues with its design largely unchanged, but adds a longer wheelbase option and makes the rearview camera standard across the lineup. Several advanced options such as leatherette upholstery, automatic climate control, blind-spot monitoring, lane departure warning, and more are available for the Metris, making it one of the more user-friendly of the commercial offerings available. The 2018 Metris is split into two basic styles, each with two trim pakages. The Cargo model is what its name implies and is offered as a Worker Cargo spec for lower-end buyers. The Passenger model has two rows of seating and side windows, while the Worker Passenger drops many of the extras added to the standard Passenger to cater to budget fleet buyers. The 2017 Mercedes-Benz Metris continues where the Metris was introduced two years ago. It's a North American version of the Spanish Vito, differing from that model mainly in engine and drivetrain. The Metris replaced the Sprinter van formerly sold under the Mercedes-Benz banner. The 2017 Metris comes in four basic variants, all of which are based on the same midsize commercial van design. The Metris Cargo is focused on - you guessed it - cargo hauling. The Passenger adds two rows of bench seating in the rear. For those focused entirely on utilizing the no-frills get-the-job-done mentality of commercial vehicles, the Metris Worker Cargo and Worker Passenger offer fewer options in exchange for a lower price. The 2017 Metris is a surprisingly good van, fitting somewhere in between the compact and large vans offered by most competitors. The Metris maximizes interior room and daily workability with excellent feature sets and a solid list of standard features, including a safety feature that aids stability in high winds. That's important in a van this tall. 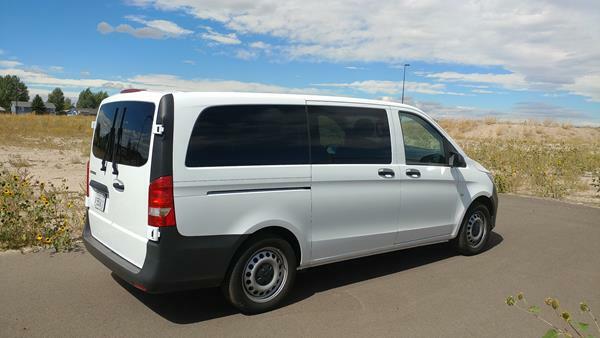 The 2017 Mercedes-Benz Metris is a good workhorse with a smart package design that allows buyers to customize or strip down the van to their specific needs and budget. The Metris might cost more than the rivals it's usually compared to, but most of them are either smaller or not as feature rich.